It was fantastic! Great performances, very talented musicians! I'm keeping an eye out for Mr. Golka's next performance in NYC. Fantastic performance! Thoroughly enjoyed it. Exciting pianists, who have an effective, energetic rapport. And they enjoy a comfortable, easy connection with the audience. Excellent, a nice pairing of serious and fun. This was probably the best concert we ever attended. They were phenomenal -- very gifted, very talented. The performance of the animals narrated was wonderful. They received a standing ovation -- deservedly so!!!!! The music was wonderful, the playing masterful, the seats were great. Superb musicianship throughout. The pianists are terrific both as soloists and in the Hungarian Dances, and Mr. Weiss led a multi-talented group of players in a fresh and charming performance of Carnival of the Animals. It was a wonderful afternoon. fantastic concert! and i love alice tully hall. interesting program with a very funny and entertaining 2nd "act". love 4 hand piano music. This was an amazing performance - both Golka and Weiss are solid masters of the keyboard who brought new life and magic to the music. Brahms must have been smiling wherever he was, to hear his music so wonderfully expressed. We thoroughly enjoyed the concert. Adam Golka and Orion Weiss played the Brahms' pieces with feeling and very good technique. Our favorite part though was Carnival of the Animals from Saint Saens. which was lovely and funny at the same time. run to hear them if they come to your town. Fabulous musicians! Very interesting program! the show was produced in a very interesting way, funny,exquisite, passionate! GREAT SHOW! Absolutely wonderful concert. Brahms Variations really memorable. Thank you! Amazing pianists! In perfect sync. Each piece on the program was executed with more energy as the concert went on. Thank you Adam. Thank you Orion! Excellent! And a nice portion of humor! A truly delightful concert - 2 marvelous pianists, interesting selection of works. Could the season of vocal music have gotten off to a better start than the Musicians Emergency Fund recital at Alice Tully Hall? We think not. 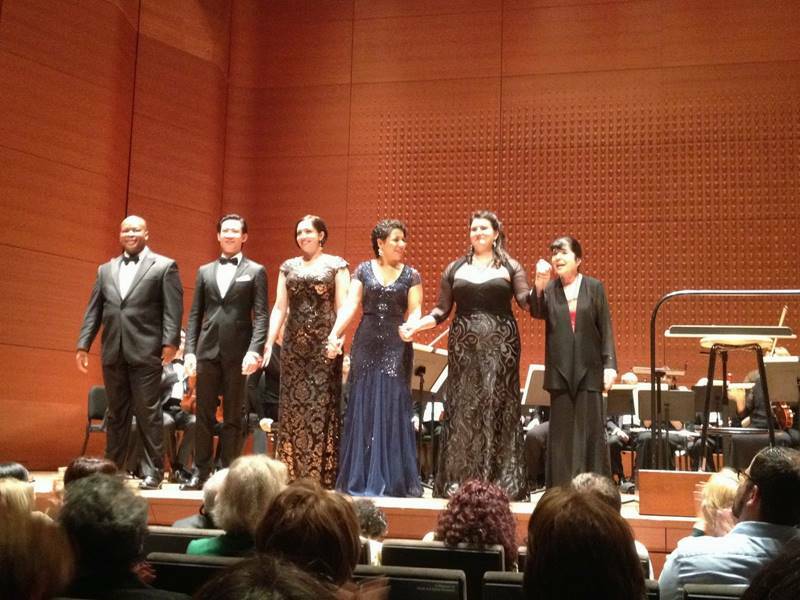 Maestra Eve Queler and her fine Opera Orchestra of New York served as background to showcase five superlative singers, all of whom we would happily listen to over and over again. The Opera Orchestra of New York has a long and venerable history in New York City, having presented over 100 operas in concert version and the Maestra has proven her worth, not only as a conductor, but as someone with a great ear for emerging stars. Similarly, the Musicians Emergency Fund has a history going back to the Great Depression and has also brought talent to the public's attention. In an entirely different style, she sang Donna Anna's aria "Non mi dir" from Mozart's Don Giovanni; her fioriturawas just about perfect. In yet a different vein, she performed Musetta's aria "Quando m'en vo" from Puccini's La Boheme, always a great showpiece. And "Song to the Moon" from Dvorak's Rusalka was another showstopper that revealed Ms. Kerr's seamless transitions throughout the registers. There wasn't a tenor onstage but we never missed it because the two male singers were so outstanding. Baritone Yunpeng Wang opened the program with "O Lisbon" from Donizetti's rarely heard Dom Sebastienwhich he sang in fine French, making every word clear, a great advantage since there were no translations. Mr. Wang has a most pleasing tonal quality and ample coloring as he shifted from longing to passionate outbursts. Bass-baritone Musa Ngqungwana pleased us with one our favorite arias from Puccini's La Boheme. In"Vecchia zimarra", Colline is bidding farewell to the beloved overcoat he is about to pawn to raise money for the dying Mimi's medicine. He sang this with superb dynamic control and deeply felt grief. On Sunday, September 21, at Alice Tully Hall, Musicians Emergency Fund (MEF) presents Eve Queler & Friends with Opera Orchestra of New York—a sequel to two similar fall programs, given in 2012 and 2013, in honor of conductor/coach Eve Queler. 2 and 3 about these singers and their careers in progress. Eve Queler, founder and conductor laureate of OONY, was born and largely educated in Manhattan, where she pioneered a difficult path at a time when women could scarcely imagine a conducting career. Through ability and persistence, she earned posts as a rehearsal pianist and vocal coach, first with New York City Opera, then with the Metropolitan Opera Studio, a touring group that performed in schools. To achieve a podium of her own, she rallied support to found a workshop that developed, under her leadership, into OONY. She went on to international eminence as a guest conductor of opera and symphony in the U.S. and abroad. Chevalier des Arts et des Lettres from the French government. In the U.S. as well, in October 2010, the National Endowment for the Arts granted her a Lifetime Achievement Award in Opera, citing her focus on unusual repertory and her dedication to emerging singers. Tickets for MEF’s third Eve Queler concert are $25 at the Alice Tully Hall box office or online at www.lincolncenter.org, Seniors, students and military can obtain free tickets by showing ID at the Alice Tully Hall box office on the day of the event (Sunday, September 21) from 11:00 A.M. until concert time, 3:00 P.M.